It was 10 a.m. and Anna Bill had just fallen asleep. It had been another rough night. She’d taken one person into custody and had responded to a suicide attempt. The Mountain Village village police officer had already drifted off when Gov. Bill Walker called. 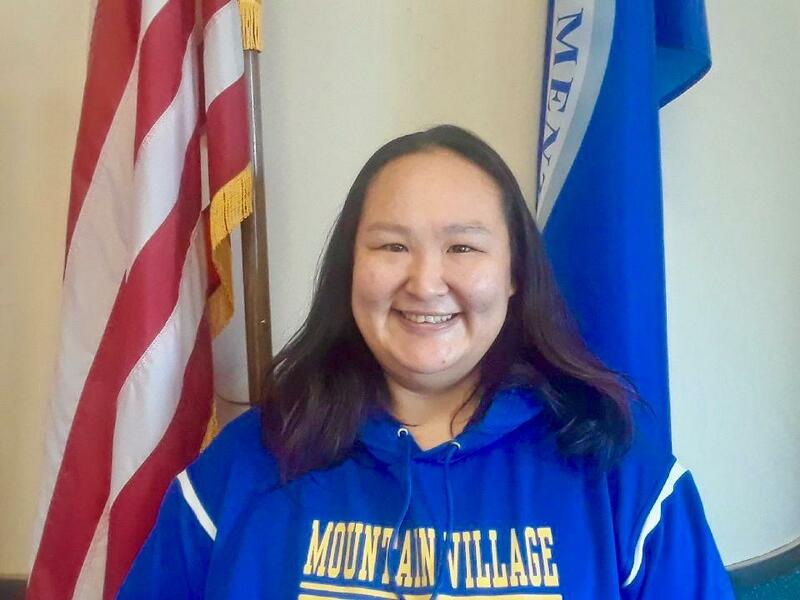 “And I thought I was dreaming,” Bill told KYUK on Tuesday at the Bethel airport during a brief layover on her way to the Alaska Federation of Natives Convention in Anchorage. Through the phone line, Gov. Walker told Bill, “Congratulations! You’ve won the 2018 Shirley Demientieff Award.” The annual award presented by Alaska’s Governor at the Alaska Federation of Natives Convention honors an individual or organization for their work to improve the lives of Alaska Native women and children. Then another thought occurred to her. She would have to write an acceptance speech. Bill took to Facebook to ask for pointers, and she’s drafted something that she’s proud to share. Bill had stepped back into her role as a village police officer a couple days before Gov. Walker’s call. A month prior, she’d resigned from the position while on medical leave for an on-the-job injury incurred by someone physically assaulting her. Bill decided she needed to help herself before she could help her community. During her month off she sought counseling, and all the while, people in Mountain Village encouraged her to return to public safety. She decided to return to work. The night before she was due back, tragedy struck. A person in the community committed suicide. When Bill had been on the force, she had responded to 66 suicide attempts in less than a year and no one had died on her watch. “It took a lot out of me just thinking about, you know, what if he’d had somebody to talk to? Or what if I’d signed on a day before? Or, you know, there’s always these ‘what ifs’,” Bill said. The next morning, Bill was back on the job. That was last week. The death is motivating her more than ever to respond thoroughly to every call, and this time she’s not alone. Previously Bill had often been the only law enforcement in town. Now, she is joined by a fellow village police officer and two tribal police officers. Something else is different; the officers share a small spending budget to buy uniforms. She hopes that the city and tribe can also secure grants to provide training and buy safety equipment for the officers. “To get more handcuffs, and mace, and bulletproof vests,” Bill listed. And to pay their officers in full. Bill is on call 24/7, but often she avoids clocking in and instead volunteers her time. She has a family to support, but knows that the city lacks the money to pay for all of her hours. Bill hopes that receiving her award will motivate government officials to better fund public safety in rural Alaska. In the meantime, Bill encourages communities to respect and thank their law enforcement officers for their work. She says that support is often what keeps her going. Mountain Village Village Police Officer Anna Bill is scheduled to receive the Shirley Demientieff Award from Gov. Bill Walker at 9:45 a.m. on Thursday at the Alaska Federation of Natives Convention. Below is the full speech Bill has prepared. First of all, I want to say what an honor it is to be here being presented with the Shirley Demientieff Award. I never imagined I would be standing in front of all of you today. I would like to thank Governor Bill Walker for presenting me the award and also to my friends and family, Michelle, my childhood best friend and boss, the Mountain Village City Council, the mayor, Matt Andrews. Also to Sergeant Kevin Yancey with the Alaska State Troopers for believing in me and always standing by my side. Being the only female police officer in Mountain Village has its challenges. There will be times where you are challenged, where nothing seems to be going right, where tragedy strikes, and you’re left to pick up the pieces. These experiences leave us feeling weak and hopeless, but that is no reason to stay down for long. No matter what you’re going through in life, other people just like you have gone through the same or worse and have come out stronger than before. It’s times like these you need to stand strong and never give up. Be the person who touches the lives and hearts of people. Be a positive light to others as you put a smile on their face. For in the end, it’s not what you say that matters; it’s how you make them feel that lovingly stays in their memory. I have always been inspired by my late mom Maria Koutchak, my father Leonard Landlord, and my late grandfather Dana Kopanuk to work hard, to always have faith, courage, honesty, but most importantly, to always work from your heart. Everyone has a story, but not everyone has a voice. That’s where I come in. I want to be that voice for our people. I want to hear the stories. I want to help write the pages, and most of all, I want our people to know there is someone who loves and cares for them, regardless of what their past holds. As I look at my children, I want them to remember the courageous mother they have. A mother whose love is so strong and so pure that I have endeavored a lot of heartaches, turmoil, travesty. I have been assaulted numerous times while making arrests. I have been threatened and outnumbered, but that has not deteriorated my dedication to my people. As I continue to move forward, I’m astonished by the number of lives I’ve touched, the number of people I’ve saved, the number of people who look up to me, the elders who give me strength, and my community who gives me hope, courage, and the support I need to push forward another day. I will continue to work hard with integrity, honesty, and with faith as long as I possibly can. I will continue to uphold my badge with honor. For I hope to inspire someone to never give up, no matter how hard life may get.